What's the Best 2018 Ford EcoSport Trim Level for Me? Ford’s newest compact SUV, the 2018 Ford EcoSport, is everything you want it to be. Its compact size, spacious interior, and highly-efficient engine choices make it an awesome choice for drivers everywhere in Southern California. However, the Ford EcoSport has four unique trim levels, and discovering which one is best for you might take a bit of help. Your trusted source of all Ford SUVs, the Southern California Ford dealers, can make your decision a little easier. Browse through the differences between the four trim levels available on the 2018 Ford EcoSport, available from your Southern California Ford dealers. But know this: When you’ve settled on the Ford EcoSport, you’ve already won. Its price say’s ‘entry level’, but it’s features certainly don’t. The 2018 Ford EcoSport S is packed with the basics and more, inside and outside. As standard equipment, the Ford EcoSport S has an extremely efficient 1.0-liter EcoBoost three-cylinder engine under the hood with Auto Start-Stop Technology, perfectly paired with a 6-speed SelectShift transmission for ultra-economical driving. AdvanceTrac with Roll Stability Control is standard equipment for supreme traction. Intelligent 4WD is available on the Ford EcoSport S, upgrading the engine to a 2.0-liter Ti-VCT four-cylinder. An innovative wide-swinging tailgate makes cargo access convenient, and a rear-view camera is standard so you can detect obstacles behind you. Air conditioning, 12V and USB power points, power windows, Ford’s SYNC infotainment system, and sporty fabric seating make the interior comfortable for short or long hauls. An extremely popular choice is the 2018 Ford EcoSport SE trim. It adds desirable equipment for an enhanced ownership experience. The engine options are the same on the Ford EcoSport SE: either the 1.0-liter EcoBoost three-cylinder with 123hp and front-wheel drive, or the 2.0-liter Ti-VCT four-cylinder with 166hp and Intelligent 4WD. On the outside, 16-inch aluminum wheels are standard and 17-inch alloy wheels are optional. Automatic climate control, Intelligent Access with Push-Button Start, heated front cloth seats, a power moonroof, and automatic headlights are standard equipment on the SE trim. Also, the SE Convenience Package adds ambient LED lighting, Blind Spot Information System, SYNC 3 infotainment, SYNC Connect, and more. All 2018 Ford EcoSport SES models receive the 166-hp 2.0-liter four-cylinder engine with Intelligent 4WD as standard equipment. Sport-tuned suspension, steering wheel-mounted paddle shifters, and 17-inch alloy wheels are also standard for premium appearance and control. A Cargo Management System and retractable cargo cover are included on the EcoSport SES and copper-colored instrument panel accents give it an interior look all its own. SYNC 3 with voice-activated touchscreen Navigation, SYNC Connect, and a Wi-Fi hotspot are standard equipment. Leather heated seating surfaces are available, and the SES Cold Weather Package includes a heated steering wheel, heated side mirrors, windshield wiper de-icer, and front and rear floor liners. 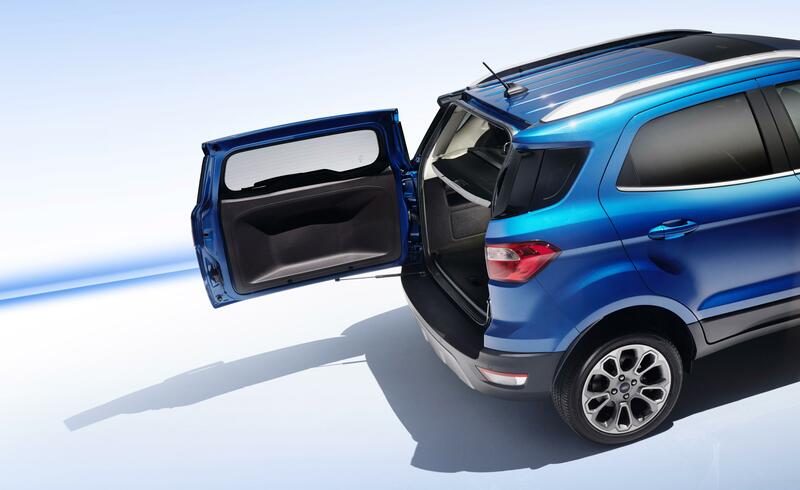 The top trim is the Ford EcoSport Titanium, giving the best that these Ford SUVs have to offer. Like the S and SE trims, either the 1.0-liter EcoBoost with FWD or 2.0-liter Ti-VCT four-cylinder with Intelligent 4WD are available. Fog lights and LED signature lighting give a distinct appearance to the Ford EcoSport Titanium. The 2018 Ford EcoSport Titanium includes all the interior fixings of the SES trim, as well as B&O PLAY Premium Audio by HARMAN, leather heated front seats with a 6-way power driver’s seat, and Blind Spot Information System as standard equipment. It’s the premium experience in a compact SUV. 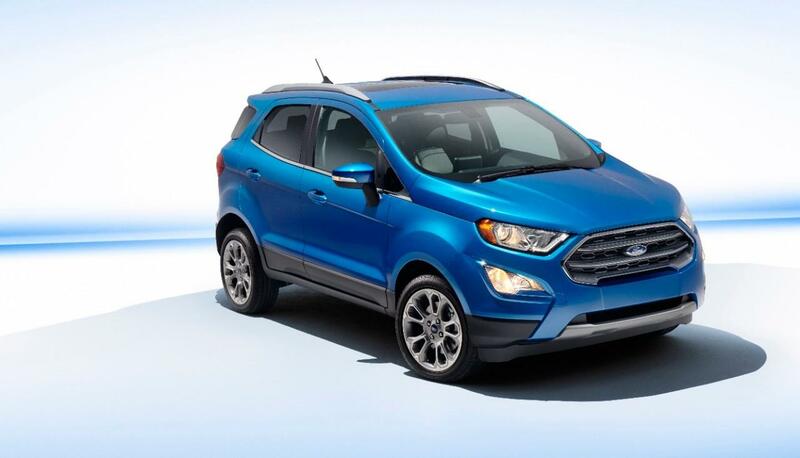 With four available trim levels, there’s a Ford EcoSport that’s just right for you. Choose the cost-effective Ford EcoSport S or SE trim, the powerful AWD-equipped SES trim, or the premium Titanium model. Whatever 2018 Ford EcoSport you’d like, you’ll find it at your local Southern California Ford dealer.